The original line was written in 1974 by critic Jon Landau, and he was talking about Bruce Springsteen. No one expects Mittelstadt – one of the the world’s top young players – to become the Boss of the NHL in the immediate future. 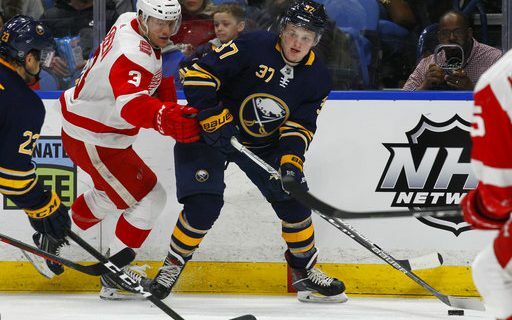 Still, those in the KeyBank Center on Thursday night were hoping that the first of many “Glory Days” would be celebrated in Mittelstadt’s debut. Instead, it was another discouraging loss in Buffalo Sabres present for a team that has had a bunch of them. The Detroit Red Wings – who hadn’t won in the last 11 road games, their worst such streak in decades – erased an early 2-0 lead to defeat the Sabres, 6-3. Mittelstadt was clearly the focus for most in a meaningless game between two struggling teams. He went through the typical rookie initiation – he led the Sabres on to the ice, only to find once he got there that he was alone for a little while. The young center (19 years old) was the darling of the 18,493 in the building. He received applause when he touched the ice for his first shift, applause when his NHL debut was cited by the public address announcer, and cheered when he picked up his first point – winning a faceoff that directly led to a goal by Evan Rodrigues. “Once you’re out there, it’s just hockey. I felt comfortable,” Mittelstadt said. The forward hadn’t played a game since the University of Minnesota finished its season earlier in March, so a little rust was to be expected. The reviews from the rest of the Sabres were quite positive. “He played great,” Ryan O’Reilly said. “Coming to the worst team in the league, to a team that’s struggling all year and not making a lot happen, he definitely stepped up. It was nice to see him get on board. Mittlestadt’s presence appeared to give everyone in a Sabres uniform a boost from the start of the game. Jack Eichel and O’Reilly scored in the first seven minutes for an early Buffalo lead. But the good feelings lasted only 30 seconds, as Dylan Larkin got one back from Detroit. The Sabres had a pair of short-handed breakaways in the final stages of the first period, but couldn’t convert them. Those who have been watching this season can guess what happened next – the Red Wings had a short-handed breakaway of their own in the second period, started by a bounce off a lineman, and Darren Helm converted on it. “The short-handed goal took something out of us,” Housley added. O’Reilly then said he lost his man on defense, and Anthony Mantha scored an “easy one” to give Detroit the lead for good. The last goal, and the last straw, came with 3:01 left when the Sabres turned the puck over while trying to get goalie Chad Johnson out in favor of an extra attacker. Evgeny Svechnikov finished Buffalo off by putting the puck into the vacated although not technically empty net. “We just made too many critical mistakes at the wrong time,” Housley said. The loss means the Sabres are at least five points behind every other team in the NHL, as Ottawa won in overtime on Thursday. The likelihood of a last-place overall finish by Buffalo for the third time in five years continues to grow. It would make for a more appropriate ending to this column if Mittelstadt, who was indeed Born in the U.S.A., and the Sabres headed for the Springsteen’s swamps of New Jersey to play the Devils next. They’ll have to settle for a trip to Nashville, where the team with the league’s best record will be waiting on Saturday.